Post prom parties have become the entertainment of choice for schools, parents, and students because they provide the pupils with a safe option for their after prom celebrations. The prom after party has become just as popular and highly anticipated as the prom itself. Students and their families spend months fundraising and preparing for these all night bashes to make sure all the essentials are covered before the big day arrives. Big Bounce Fun House Rentals is prepared to help high school students and their supporters plan the perfect post prom party. Post prom parties have become the entertainment of choice for schools, parents, and students because they provide the pupils with a safe option for their after prom celebrations. Parents and guardians like knowing the young adults are having fun at a designated, safe, drug and alcohol free place. Preparation for these school functions should start early to make sure all the essentials are covered. With over 20 years experience hosting high school celebrations, the owners of Big Bounce Fun House Rentals know exactly what is needed to entertain students during their after prom party. Their black light rental includes glow-in-the-dark bands, necklaces, face or body paint, neon dodgeballs, a fog machine, and a bubble making machine to provide the most fun to all the students during their night of fun. Equally exciting, the game show mania is a computerized gaming system complete with a podium, host, buzzers, and screen. Students can ask personalized questions while playing one of their favorite television game such as Deal or No Deal, Jeopardy, Family Feud, Dating Game, Newlywed Game, and Wheel of Fortune. Proms and post prom parties are a multi-billion dollar event. According to a national Visa Survey, the average student spends over $900.00 on their big night. The after prom party has become an important part of the night. Having high quality entertainment is essential for hosting a superior after prom party. 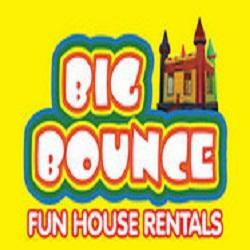 Big Bounce Fun House Rentals has many high quality interactive and inflatable rentals that compliment their after prom party package. Inflatable obstacle courses, a Velcro wall, bungee run, human bowling, dry slides, and foam pits are exceptional rental products that can be easily incorporated with the after prom package for an unforgettable night. After prom parties are a highly anticipated part of the school experience and Big Bounce Fun House Rentals staff are available to make sure prom committee members have everything, they need to host an unforgettable night. With AAA insurance and liability coverage on all their rental equipment, the staff are prepared to help committees plan the best after prom party for their high school students. Andy and Susan Lorimer started their event planning and rental business over 20 years ago. Since first opening their doors, they have built a solid reputation that is based on superior service and product. As the number one event planning and rental company in Indiana, the friendly staff always go above and beyond to make sure their client’s needs are fully met.